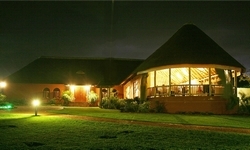 Situated in the Hartbeespoort area, a mere 40 minutes drive from Brits, Sandton and Pretoria. The Conference Centre: Both a SA Tourism Grading Council 5-star venue, as well as a MICE (Meetings, Incentives,Conferences,Exhibitions) Centre for Communication Excellence. Modern, fully equipped, air-conditioned Conference Rooms and Executive Boardroom. Teambuilding activies, Zip Line - unique adventure in the sky consists of 7 slides connected to 10 platforms ranging in height from 2 meters up to 14 meters on site! Game drives and soul walks. Accommodation: 48 luxury units, all equipped with Tv's, and 2 Super Luxury units with Victorian bathrooms and jacuzzi's. Impala Restaurant: Scrumptious Buffet Breakfasts, Legendary Sunday Buffet lunches, A la Carte menus, Romantic wine and dine in the Goronga Wine Cellar. Light lunches served on Waffle Deck.